Chilliwack Council has named Brian Minter as the fourth recipient of the Order of Chilliwack medal, an award to recognize citizens for outstanding achievement or long term contribution to our community. 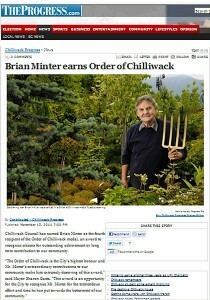 Brian Minter is a gardening icon, broadcaster, author, columnist, international speaker, husband, father and grandfather. In his spare time, he continues to serve the community. He has served as the first Chancellor of the University of the Fraser Valley, as a board member of Chilliwack Economic Partners Corporation and as the Chair of Tourism Chilliwack, to name only a few. While Minter will retire as chair of Tourism Chilliwack at the end of this year, he will remain on the board as past chair. 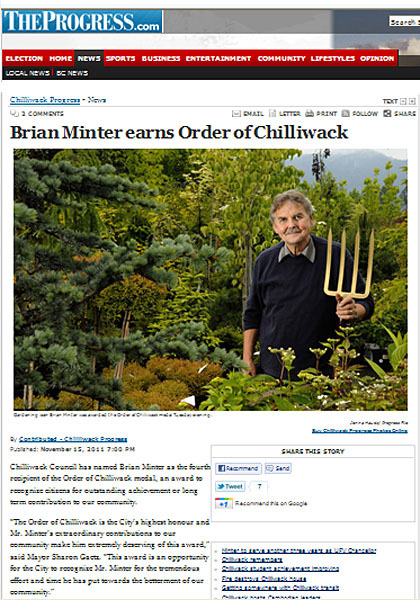 Brian Minter is, arguably, one of Chilliwack’s most famous people. He is a legend in the gardening world and the chancellor of the University of the Fraser Valley (UFV). On Tuesday evening, Chilliwack city council honoured Minter’s contribution to the community and outstanding achievements with the fourth Order of Chilliwack medal.